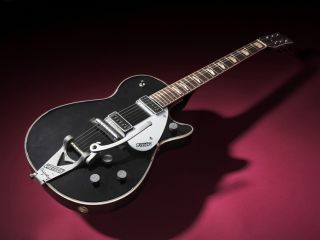 NAMM 2011 PRESS RELEASE: Gretsch is extremely proud to introduce a very special limited edition instrument, the Gretsch Custom Shop G6128T-GH George Harrison Tribute Duo Jet. Limited to 60 pieces worldwide, the guitar is a meticulously crafted replica of the all-black 6128 Duo Jet Harrison played with the Beatles from summer 1961 through spring 1963, a historic period that covered the group's meteoric rise from regional popularity at home in Liverpool to its gritty rock n' roll apprenticeship in the seedy nightclubs of Hamburg, Germany, to the madness of Beatlemania. Harrison prized his Duo Jet, often referring to it as his first truly good guitar, and as such it occupies a very special place in the history of Harrison, the Beatles and the greater history of rock music in general. It is heard on many early Beatles recordings, and, decades later, on his acclaimed 1987 album Cloud Nine, Harrison posed with it for the cover. The new Gretsch replica, built by master luthier Stephen Stern and his crew at the Gretsch Custom Shop, mirrors every scratch, ding and rust spot of Harrison's guitar. True to form, the tremolo arm of its Bigsby® B6C tailpiece has a black Phillips head pivot bolt, and the strap button on the lower bout is offset to accommodate the Bigsby®. Harrison bought the guitar in summer 1961, from Liverpool cab driver and former merchant seaman Ivan Hayward. Hayward, who bought the guitar new in 1957 in New York, had the Bigsby® installed soon after buying the guitar. Offered for sale at £90, Harrison had paid Hayward £70, writing an IOU for the remaining £20 on the back of the instrument's customs slip (since settled, Harrison fans will be interested to know). "It was my first real American guitar," Harrison told Guitar Player magazine in 1987. "And I'll tell you, it was secondhand, but I polished that thing. I was so proud to own that." Indeed, Harrison had procured a truly fine guitar for himself, no small feat for an 18-year-old in Liverpool in 1961 and a very large step up from the poor-quality, difficult-to-play Futurama model he'd been playing up to that time. It became Harrison's main guitar. In addition to the many Cavern gigs, this meant that the Duo Jet accompanied the young guitarist on several of the Beatles' legendary visits to Hamburg, Germany. Harrison played the guitar during their 1962 stints at the Star-Club in April, May, November and December. This was a wild and formative chapter in Beatles history; Hamburg was where the group honed its live skills, widened its reputation, lost a certain amount of innocence and recorded and released its first single (My Bonnie, backing singer Tony Sheridan, June 1961). Harrison played his black Gretsch Duo Jet at the Beatles' first recording session at Abbey Road Studios in London, on June 6, 1962, and at subsequent sessions later that year and in early 1963. Consequently, the guitar is heard on early Beatles singles such Please Please Me, the group's second single and first number-one hit, and on most of their March 1963 debut album Please Please Me, which includes famous tracks such as I Saw Her Standing There, Love Me Do, P.S. I Love You, Do You Want to Know a Secret and a magnificently raucous cover of Twist and Shout. As Beatlemania gripped the UK, Harrison acquired other Gretsch guitars after mid-1963, most notably the Country Gentleman® and Tennessean® models, and largely retired the Duo Jet. In the mid-1960s, he gave the Duo Jet as a gift to bassist and artist Klaus Voormann, a longtime friend of the band from the Hamburg days well known to Beatles fans as the designer of the seminal 1966 Beatles album Revolver, as well as the mid-'90s Beatles Anthology albums. For these late-1985/early-1986 repairs, Harrison turned to noted UK guitar tech Alan Rogan, with whom he had worked before. Rogan in turn entrusted the restorative work to luthier Roger Giffin, who rewired it (because the original wiring was disintegrating) and installed a spare DeArmond® pickup in the neck position that was much closer to the original than the neck pickup Voormann had installed. In 1987, Harrison released his critically acclaimed and enormously successful Cloud Nine album, which included a massive hit in Got My Mind Set on You and a charming tribute to his Beatles years in When We Was Fab. "When the time came to shoot pictures for the cover," Harrison said, "I was asked if I could take a guitar down for the photo session for the new album, and so I picked that one, and that's it, the old black Gretsch." Consequently, there is perhaps a touching symmetry to the notion that Harrison started his career and returned to it decades later for yet another enormous hit album with the first real decent guitar he ever had; the one he bought at age 18 with money he'd worked so hard to save from those early Beatles gigs in Hamburg and in the dank confines of the Cavern. The one he affectionately called the old black Gretsch.